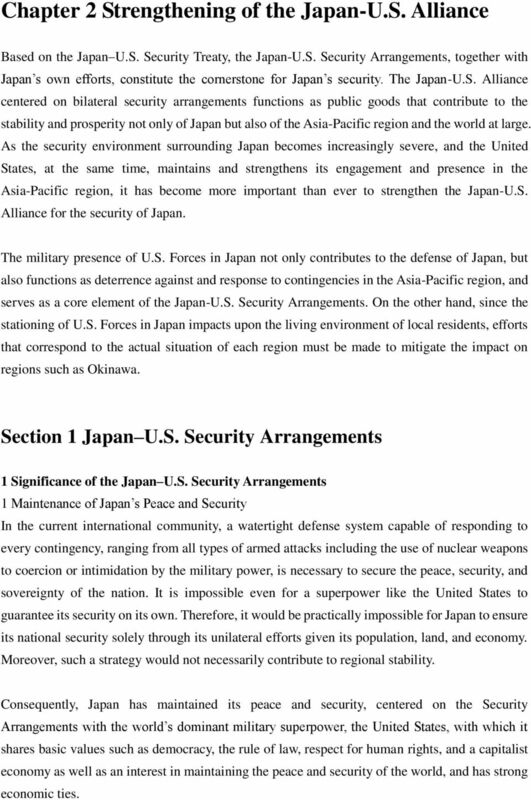 Download "Chapter 2 Strengthening of the Japan-U.S. Alliance"
1 Chapter 2 Strengthening of the Japan-U.S. Alliance Based on the Japan U.S. Security Treaty, the Japan-U.S. Security Arrangements, together with Japan s own efforts, constitute the cornerstone for Japan s security. The Japan-U.S. Alliance centered on bilateral security arrangements functions as public goods that contribute to the stability and prosperity not only of Japan but also of the Asia-Pacific region and the world at large. As the security environment surrounding Japan becomes increasingly severe, and the United States, at the same time, maintains and strengthens its engagement and presence in the Asia-Pacific region, it has become more important than ever to strengthen the Japan-U.S. Alliance for the security of Japan. The military presence of U.S. Forces in Japan not only contributes to the defense of Japan, but also functions as deterrence against and response to contingencies in the Asia-Pacific region, and serves as a core element of the Japan-U.S. Security Arrangements. On the other hand, since the stationing of U.S. Forces in Japan impacts upon the living environment of local residents, efforts that correspond to the actual situation of each region must be made to mitigate the impact on regions such as Okinawa. Section 1 Japan U.S. Security Arrangements 1 Significance of the Japan U.S. Security Arrangements 1 Maintenance of Japan s Peace and Security In the current international community, a watertight defense system capable of responding to every contingency, ranging from all types of armed attacks including the use of nuclear weapons to coercion or intimidation by the military power, is necessary to secure the peace, security, and sovereignty of the nation. It is impossible even for a superpower like the United States to guarantee its security on its own. Therefore, it would be practically impossible for Japan to ensure its national security solely through its unilateral efforts given its population, land, and economy. Moreover, such a strategy would not necessarily contribute to regional stability. Consequently, Japan has maintained its peace and security, centered on the Security Arrangements with the world s dominant military superpower, the United States, with which it shares basic values such as democracy, the rule of law, respect for human rights, and a capitalist economy as well as an interest in maintaining the peace and security of the world, and has strong economic ties. 2 Specifically, as well as providing facilities and areas for the U.S. Forces, based on Article 6 of the Japan U.S. Security Treaty, Article 5 of that treaty stipulates that Japan and the United States will take bilateral action in the event of an armed attack against Japan. The U.S. obligation to defend Japan in the event of an armed attack means that, if a country plans to attack Japan, the attacker must be prepared to confront not only the defense capability of the SDF, but also the overwhelming military strength of the United States when planning such an act. As a result, the opposing nation becomes aware that they will suffer grievously if they carry out an invasion and such desires are stopped at the planning stage. In other words, this serves to deter attacks. Japan intends to effectively utilize the deterrence power of the U.S. military in addition to maintaining adequate Japanese defense forces in order to create a seamless posture and secure Japan s peace and security. 2 Maintenance of Peace and Stability in the Region Surrounding Japan Article 6 of the Japan U.S. Security Treaty states contributing to the security of Japan, and the maintenance of international peace and security in the Far East as the purpose of the use of facilities and areas by the U.S. Forces within Japan. This provision is based on the recognition that the security of Japan is closely tied to the peace and security of the Far East region to which Japan belongs. In the regions surrounding Japan, there are many states and the like with massive military power and some states that retain nuclear weapons or continue nuclear development. In addition to issues or tension caused by changes in the balance of power, situations that we call gray zones over sovereignty of the territory or vested interests are likely to arise, and this risks further aggravation of the situation. In such a security environment, the military presence of the U.S. Forces in Japan provides deterrence against unexpected contingencies caused by various security issues or unstable factors, providing a great sense of security to the nations in the region and thus fulfilling a role as public goods. Also, the close bonds of cooperation based on the Japan U.S. Security Arrangements constitute the foundation of the United States commitment to the peace and stability of the region surrounding Japan. These arrangements, complemented by the alliances established between the United States and other countries in the region such as South Korea, Australia, Thailand and the Philippines and also by the friendly relations developed with other countries, play an indispensable role in maintaining the peace and stability of the Asia-Pacific region. 3 3 Further Stabilization of the International Security Environment The Japan U.S. Security Arrangements are the foundation for a comprehensive and friendly cooperative relationship between Japan and the United States, not only in defense but also in a wide range of areas, including political, economic, and social aspects. 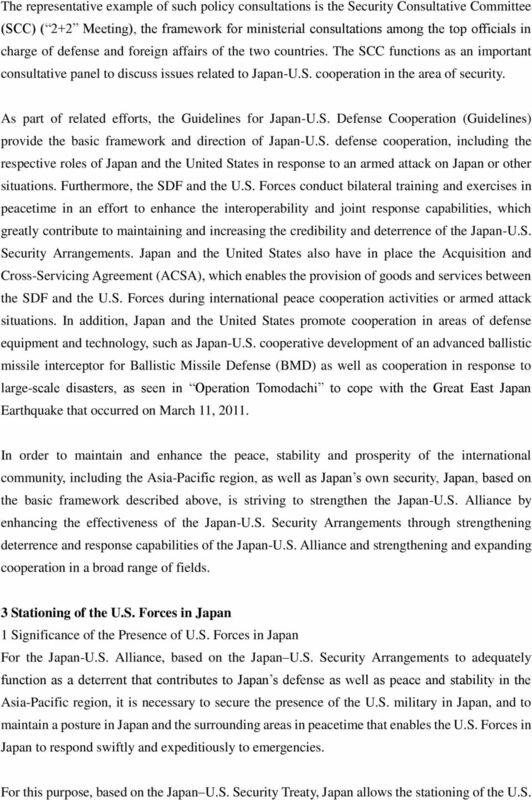 The Japan-U.S. Alliance, with their security arrangements at its core, also forms the basis for Japan s foreign policy. It contributes to Japan s ability to implement positive measures to maintain the peace and security of the international community, including promoting multinational security dialogue and cooperation, and cooperation in various activities of the United Nations. Current security issues in the international community include responses to proliferation of weapons of mass destruction and ballistic missiles, international terrorism, and acts of piracy, as well as new risks concerning stable access to the seas, space, and cyberspace. It is extremely difficult for any single country to tackle such global security challenges alone, and it is important for countries involved to work together regularly in peacetime. In this international environment, the strong bonds forged between Japan and the United States are also playing an important role in the efforts implemented by Japan to effectively respond to such issues. In particular, under the Japan U.S. Security Arrangements, the SDF and the U.S. Forces are working together in peacetime in a variety of areas to strengthen their cooperation. This kind of close coordination forms the foundation for various forms of international collaboration, such as antipiracy, undertaken by the SDF and the U.S. 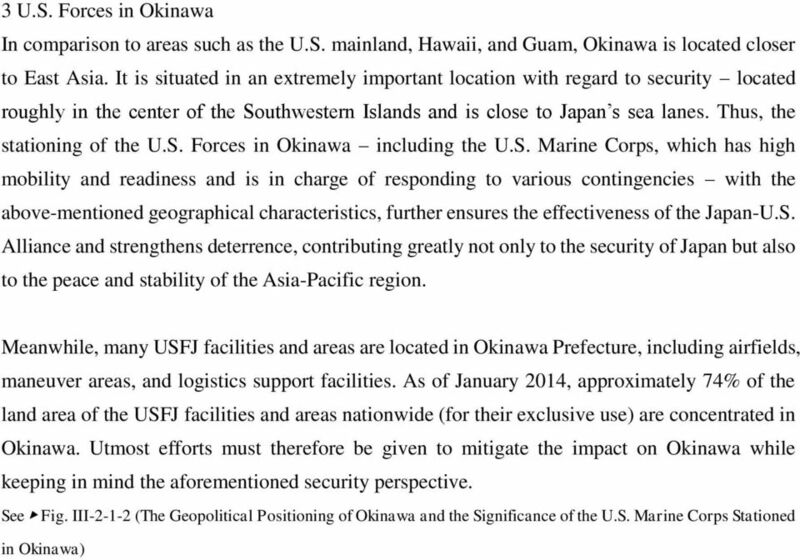 Forces, and leads to the heightened operational effectiveness of the Japan U.S. Security Arrangements. The peace and prosperity of the international community are closely linked to those of Japan. Accordingly, by cooperating with the United States, which possesses preeminent international operational capabilities, Japan is able to advance its measures to further stabilize the global security environment. This in turn is enhancing the security and prosperity of Japan. 2 Basic Framework Supporting the Japan U.S. Security Arrangements Since the conclusion of the Japan-U.S. Security Treaty up to the present, in order to ensure the effectiveness of the cooperative relationship based on the Japan-U.S. Security Arrangements with the afore-described significance, Japan and the United States have redefined their alliance in accordance with changes in the security environment at different times through persistent efforts. These efforts produced results in the form of various initiatives for bilateral defense cooperation under the framework of Japan-U.S. close policy consultations. 4 The representative example of such policy consultations is the Security Consultative Committee (SCC) ( 2+2 Meeting), the framework for ministerial consultations among the top officials in charge of defense and foreign affairs of the two countries. The SCC functions as an important consultative panel to discuss issues related to Japan-U.S. cooperation in the area of security. As part of related efforts, the Guidelines for Japan-U.S. Defense Cooperation (Guidelines) provide the basic framework and direction of Japan-U.S. defense cooperation, including the respective roles of Japan and the United States in response to an armed attack on Japan or other situations. Furthermore, the SDF and the U.S. Forces conduct bilateral training and exercises in peacetime in an effort to enhance the interoperability and joint response capabilities, which greatly contribute to maintaining and increasing the credibility and deterrence of the Japan-U.S. Security Arrangements. Japan and the United States also have in place the Acquisition and Cross-Servicing Agreement (ACSA), which enables the provision of goods and services between the SDF and the U.S. Forces during international peace cooperation activities or armed attack situations. In addition, Japan and the United States promote cooperation in areas of defense equipment and technology, such as Japan-U.S. cooperative development of an advanced ballistic missile interceptor for Ballistic Missile Defense (BMD) as well as cooperation in response to large-scale disasters, as seen in Operation Tomodachi to cope with the Great East Japan Earthquake that occurred on March 11, In order to maintain and enhance the peace, stability and prosperity of the international community, including the Asia-Pacific region, as well as Japan s own security, Japan, based on the basic framework described above, is striving to strengthen the Japan-U.S. Alliance by enhancing the effectiveness of the Japan-U.S. Security Arrangements through strengthening deterrence and response capabilities of the Japan-U.S. Alliance and strengthening and expanding cooperation in a broad range of fields. 3 Stationing of the U.S. Forces in Japan 1 Significance of the Presence of U.S. Forces in Japan For the Japan-U.S. Alliance, based on the Japan U.S. Security Arrangements to adequately function as a deterrent that contributes to Japan s defense as well as peace and stability in the Asia-Pacific region, it is necessary to secure the presence of the U.S. military in Japan, and to maintain a posture in Japan and the surrounding areas in peacetime that enables the U.S. Forces in Japan to respond swiftly and expeditiously to emergencies. 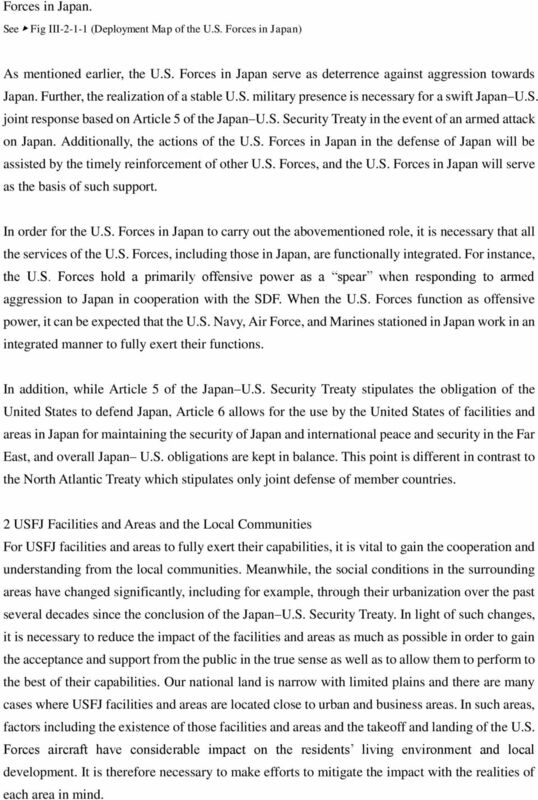 For this purpose, based on the Japan U.S. Security Treaty, Japan allows the stationing of the U.S.
5 Forces in Japan. See Fig III (Deployment Map of the U.S. Forces in Japan) As mentioned earlier, the U.S. Forces in Japan serve as deterrence against aggression towards Japan. Further, the realization of a stable U.S. military presence is necessary for a swift Japan U.S. joint response based on Article 5 of the Japan U.S. Security Treaty in the event of an armed attack on Japan. Additionally, the actions of the U.S. Forces in Japan in the defense of Japan will be assisted by the timely reinforcement of other U.S. Forces, and the U.S. Forces in Japan will serve as the basis of such support. In order for the U.S. Forces in Japan to carry out the abovementioned role, it is necessary that all the services of the U.S. Forces, including those in Japan, are functionally integrated. For instance, the U.S. Forces hold a primarily offensive power as a spear when responding to armed aggression to Japan in cooperation with the SDF. When the U.S. Forces function as offensive power, it can be expected that the U.S. Navy, Air Force, and Marines stationed in Japan work in an integrated manner to fully exert their functions. 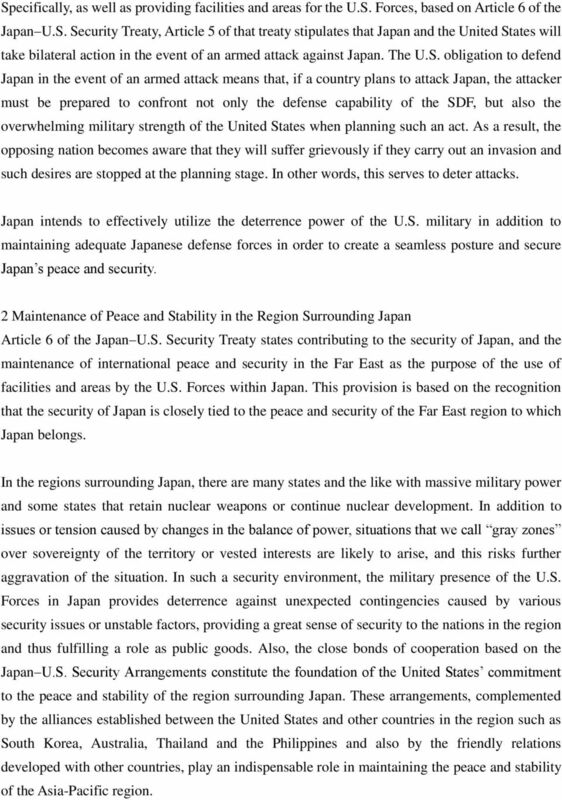 In addition, while Article 5 of the Japan U.S. Security Treaty stipulates the obligation of the United States to defend Japan, Article 6 allows for the use by the United States of facilities and areas in Japan for maintaining the security of Japan and international peace and security in the Far East, and overall Japan U.S. obligations are kept in balance. This point is different in contrast to the North Atlantic Treaty which stipulates only joint defense of member countries. 2 USFJ Facilities and Areas and the Local Communities For USFJ facilities and areas to fully exert their capabilities, it is vital to gain the cooperation and understanding from the local communities. Meanwhile, the social conditions in the surrounding areas have changed significantly, including for example, through their urbanization over the past several decades since the conclusion of the Japan U.S. Security Treaty. In light of such changes, it is necessary to reduce the impact of the facilities and areas as much as possible in order to gain the acceptance and support from the public in the true sense as well as to allow them to perform to the best of their capabilities. Our national land is narrow with limited plains and there are many cases where USFJ facilities and areas are located close to urban and business areas. In such areas, factors including the existence of those facilities and areas and the takeoff and landing of the U.S. Forces aircraft have considerable impact on the residents living environment and local development. It is therefore necessary to make efforts to mitigate the impact with the realities of each area in mind. Japanese Foreign and Security Policies under Yukio Hatoyama-What is Old, What is New? Joint Communiqué The 46 th ROK-U.S. Security Consultative Meeting October 23, 2014 Washington D.C. Does NATO s Article V Genuinely Protect Its Members? FUTURE NAVY VISION The Royal Navy Today, Tomorrow and Towards 2025 Projecting maritime power to protect and promote our nation s interests The Royal Marine Commandos - The UK s specialist amphibious force. 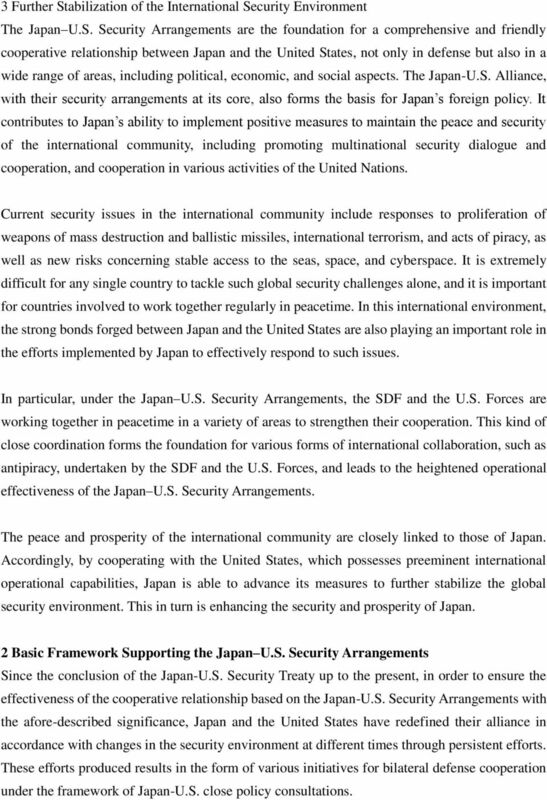 United States-Japan Security Consultative Committee Document. United States-Japan Roadmap for Realignment Implementation. The Evolving Japan-U.S. Alliance. Thank you very much, Dr. Green, for your kind. And thank you all for gathering here today. Chapter 3 Active Promotion of Security Cooperation The international community today is facing an increasing number of challenges which are extremely difficult for one country to deal with on its own. Is China Catching Up with the US? "The European Union's Security Architecture and its role to strengthen Peace and Security"
Statement by Mr. Jun AZUMI, Minister of Finance of Japan, at the Forty-Fifth Annual Meeting of the Board of Governors of the Asian Development Bank (Manila, Philippines, May 4, 2012) 1. Introduction Mr.
Joint Publication - Doctrine for Joint Nuclear Operations Final Coordination () March 00 0 0 PREFACE. Scope This publication provides guidelines for the joint employment of forces in nuclear operations. Chapter 19 America Enters the War. Click on a hyperlink to view the corresponding slides. Gary, thank you for that kind introduction and for hosting this very important gathering.